This doodle asks a simple question but as inquiries go, I've done enough of them to know that it's always the simpler ones that rock my paradigm the most. They have a habit of helping to reveal that in the world of the mundane, there are some really very extraordinary mysteries. Forget about the Secrets of the pyramids, to find a real mind bender, apparently, all I need to do is to look in a mirror. Let's start. I hold a mirror. I look. After a few seconds of reflexively thinking that there's a me here and an image 'there' that represents the me here, I pause, breathe, and go back to the basic rules of inquiry. Do it like a child. Ok, fine. I'm going to do this one like a toddler. This self has been here for years . For something that feels so real and true, why do I need to use such weak-kneed terms?! Time to look in the mirror, because that's where I can find something solid and real which is measurable. Besides, I know I can be sure of finding it. But Ugh.... here it comes.... doubt. Why do I need to look at something outside of this right-here/right-now feeling of a self in order to find myself? This doesn't make sense. The image is "out there" and yet it's the only thing I have ever recognized as me. The hand flips the phone and sees the image 'in there' of 'over there' which represents 'right here'. Ack!! Ms. Lill, you have done me in. 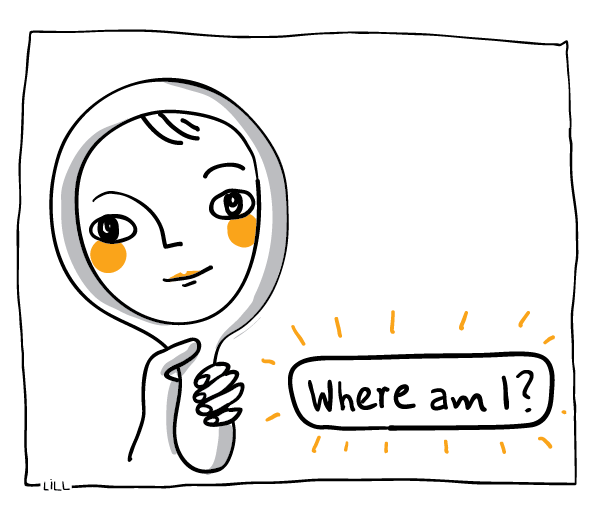 Are you "here" or is it more accurate to say that you are "there", in the mirror? Are you somewhere in between the two, or are you in both places at once? Where is the space in which the You exists? Notice images of "you" in different mirrors. What space does the You occupy in those moments? Why does it feel as though the space occupied is different from where the image is found? What evidence doyou have to support the idea that there is a 'me' here, and a 'me' there?